Vertical Development’s ShowMeTheParts app gives mobile users faster access to the largest public parts database on the market. The ShowMeTheParts app provides full access to the largest public parts database on the market on the go. Users can find parts and check photos, specifications and other information while working on their vehicles. ShowMeTheParts is the largest public parts database on the market covering 1.7 million parts from over 300 aftermarket parts manufacturers. This includes over 4.5 million applications including passenger cars, motorcycles and both heavy duty and agricultural equipment. Along with interchange information and specifications, users can view product information sheets, photos and even 360-degree views of parts. This information is constantly updated, ensuring the most accurate information available. “Users will see faster look-up speeds and smoother navigation to the freshest data in the aftermarket,” says Jay Wright, President of Vertical Development, Inc. The app not only makes access more convenient; it means users can check information when they are at their car, making direct comparisons between photos and specifications with the parts they need to replace. The app can even search local businesses to find a supplier for the part they need, putting the power of ShowMeTheParts’s catalog in their pockets. The iOS version is available from the App Store, while Android users can get it from the Google Play Store. For users whose phones don’t have a supported OS, there’s an HTML5 version of the app that can be accessed using any modern browser. Sustaining a successful manufacturing business in today’s market is quite a significant feat. Thermal Solutions Manufacturing has managed to do just that– they’ve established themselves as an industry leader in developing high-quality industrial heating and cooling parts for light and heavy-duty trucks and equipment. So, when this leader in the heavy-duty parts space went searching for the best solution for their e-catalog, Thermal Solutions turned to another industry leader for help, Vertical Development, an aftermarket tech solutions provider. Vertical Development helped to get accurate information to Thermal Solutions’ customers online in the form of an eCatalog using its proven, easy-to-use platform, ShowMeTheParts. Thermal Solutions now offers a searchable, mobile-friendly, catalog to showcase its high-quality engine cooling and temperature control automotive parts, as well as its long line of durable, easy-to-install heavy duty parts including replacement radiator cores, truck radiators, tractor radiators, lift truck radiators, industrial radiators, DPF’s, DOC’s, charge air coolers, and A/C condensers for heavy duty applications. Finding the correct parts quickly and on-demand is mandatory for meeting customer needs today. Vertical Development created ShowMeTheParts as an online complement to its catalog mapping services. It contains the largest public parts database on the market, offering millions of entries with interchange information, specifications, data sheets, photographs, and even three-dimensional views. All of this data is accessible online through a simple web interface that works on computers and mobile devices. The platform is scalable, allowing agricultural, heavy duty, and industrial manufacturers like Thermal Solutions to use ShowMeTheParts in a form that best fits their needs. With such a vast collection of parts, the company needed a robust solution to digitally organize and present a myriad of options to its customers, while also being able to readily add to its portfolio of parts. By partnering with Vertical Development, Thermal Solutions was able to bring integral parts information to its customers using a data system with years of development and refinement behind it. Now, Thermal Solutions has a distinct competitive advantage by being one of a few parts providers in this space to offer customers digital, anytime access to industrial and heavy-duty applications. The image thumbnails allow for techs to look at the parts they are servicing and compare apples to apples. In addition, customers can now use smartphones and tablets to access the catalog since it is mobile-friendly. “ShowMeTheParts gets our data updated immediately. This is critical for new product launches and it helps to reduce our overall number of returns and increase customer satisfaction,” shared David Hamill, Director of Product Management for Thermal Solutions. When Thermal Solutions saw the capabilities of ShowMeTheParts, the company decided it was the best way to get parts information from its broad portfolio into the hands of existing customers and thousands of potential new buyers. How does integration with ShowMeTheParts work? ShowMeTheParts uses an HTML5-based front end with an API that integrates with existing websites, which means both current and prospective customers can visit Thermal Solutions’ website and seamlessly look up parts information from any modern browser. The database gives users an easy way to find the information they need for ordering without having to contact customer service. Customers can search for parts by the product type and vehicle make. “For our heavy duty and industrial temperature control products, there are a number of critical data points which we must deliver to our users for them to find the correct fitment. A few of these are OE Core Size References, OE Numbers, and Product Construction Type. We needed to have this information front-and-center in our application search,” explained Hamill. To meet those precise requirements for Thermal Solutions, Vertical Development created a clean and intuitive product lookup with ShowMeTheParts, which allows users to filter on the specified information. Searches can also be done based on the part itself. A cross-referencing option can find the right Thermal Solutions part based on the part numbers from other suppliers, while the “Part Search” option displays a buyer’s guide with compatible vehicles for that part number. Both options make it easy to find replacement parts. The feedback has been tremendously positive. 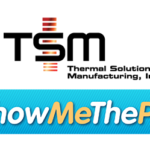 Thermal Solutions’ customers like how the new catalog powered by ShowMeTheParts gives them the ability to access and cross-reference its entire product range with a few swipes or mouse clicks, letting them find the exact parts they need from the company’s extensive line of merchandise. Employees like the support they’ve received from Vertical Development’s team to deploy the system. The integration of ShowMeTheParts makes ordering parts as easy as possible for customers, and that’s often a significant enough difference to choose Thermal Solutions over other companies with similar products. And, with over 350 brands already using ShowMeTheParts, there’s a good chance these customers already have experience using this system. Ready to take your ag, heavy duty, and/or industrial auto parts business to the next level? Contact us here, or via telephone at (630) 651-0594 or email sales@verticaldev.com to build your user-friendly digital parts catalog. Convenient and free mobile app makes parts lookup fast and easy on all devices. TrakMotive®, a leading manufacturer in CV Axles, Drive Shafts, and Window Regulators, has launched an online parts application lookup, which can be easily used on multiple mobile platforms, including Apple iOS and Android devices. The new TrakMotive Mobile app by ShowMeTheParts is free and now available at both the Apple Store and Google Play. This convenient app will allow users to quickly and easily find the correct TrakMotive part using their smartphones or tablets. Users can search for compatible parts by Vehicle Make and Model, Part Number Search, Cross Reference, and most importantly, VIN Search. As a sponsor of dozens of motorsport vehicles, PFC Brakes understands speed. They recently applied that same mindset when contracting a company to create their new mobile app. 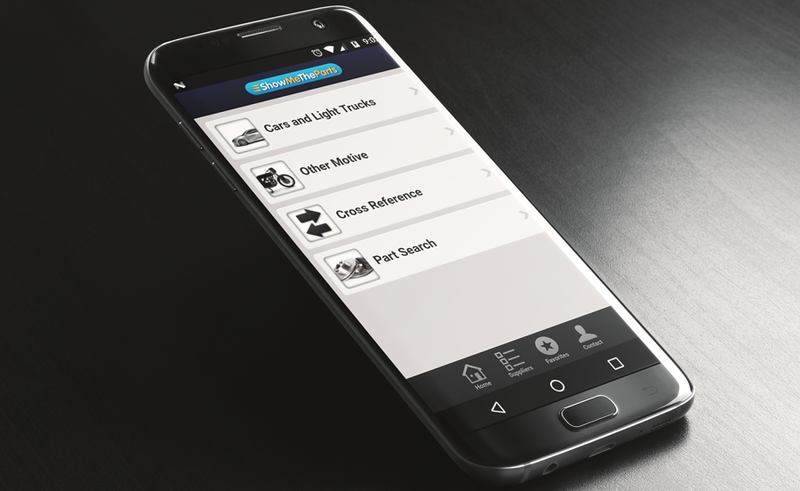 With industry leading speed to market, and lightning fast servers, ShowMeTheParts created a beautiful mobile app which allows PFC Brakes’ customers to quickly and accurately find their parts from anywhere. Our custom mobile apps have helped over 30 companies better serve their customers and sales staff. With our metrics we see that mobile app usage is trending higher than we could have anticipated. Some receive nearly 50% of their lookups via mobile devices. It’s becoming more clear that in order to be competitive, brands must have a presence in the Mobile arena. ShowMeTheParts has partnered with ChannelAdvisor to enable ChannelAdvisor retailers to feed content for the aftermarket vertical into ChannelAdvisor’s platform to start selling on marketplaces and direct channels. Now, automotive clients can participate in this segment and have unique content to differentiate from other listings that all look and appear the same. Retailers can also leverage ChannelAdvisor’s Fulfillment Service offering, which will automate the fulfillment process with distribution partners. Once a product is listed and an order taken, the order files are automatically sent to the fulfillment partner to be shipped every 15 minutes! This eliminates the need to buy and carry physical inventory and retailers know their orders are being fulfilled expertly and shipped as quickly and efficiently as possible. Vertical Development has released a critical update to their ShowMeTheParts app, giving mobile users faster access to the largest public parts database on the market. The newly updated ShowMeTheParts app provides full access to the largest public parts database on the market on the go. Users can find parts and check photos, specifications and other information while working on their vehicles. The app not only makes access more convenient, it means users can check information when they are at their car, making direct comparisons between photos and specifications with the parts they need to replace. 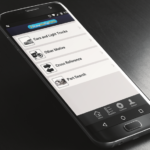 The app can even search local businesses to find a supplier for the part they need, putting the power of ShowMeTheParts’s catalog in their pockets. To get the full benefit of these updates, current users will need to uninstall the app and download the new version. The iOS version is available from the App Store, while Android users can get it from the Google Play Store. For users whose phones don’t have a supported OS, there’s an HTML5 version of the app that can be accessed using any modern browser. ShowMeTheParts and Web 2 Market aftermarket parts E-commerce/e-catalog platform has upgraded to Magento 2, bringing faster page rendering and easier inventory management to online parts sales. After years of success with Web 2 Market’s implementation of the Magento 1 e-commerce platform, Vertical Development has integrated the ShowMeTheParts database with Magento 2. This update adds a 100% responsive design that looks great on both desktops and mobile devices. It includes automatic part updates, advanced back-end tools, and faster page rendering, making it easier to use for both retailers and customers. With the ShowMeTheParts integration clients no longer have to perform the time-consuming tasks of application management of parts. Updated application data is automatically pushed to your e-commerce or e-catalog site and displayed to your customer in an SEO and desktop/mobile friendly way, allowing you to focus on more profitable tasks. Combined with Magento 2 the ShowMeTheParts integration gives you a feature-rich admin, B2B, and B2C selling tools, Content Management System, SEO friendly, professional looking e-commerce or e-catalog. 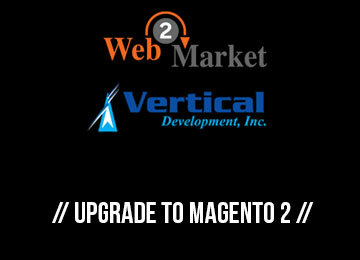 With the recent upgrade to Magento 2, Vertical Development and Web 2 Market are able to deliver a better online shopping experience for your customers and easier management for you. Vertical Development’s ShowMeTheParts database can show your customers which parts will fit their vehicle, what those parts look like and what their design characteristics are. That just leaves one thing they can’t find: inventory. With the near real time inventory system, your customers can see how many of an item you have in stock alongside all the other information that helps them find what they need for their vehicle. 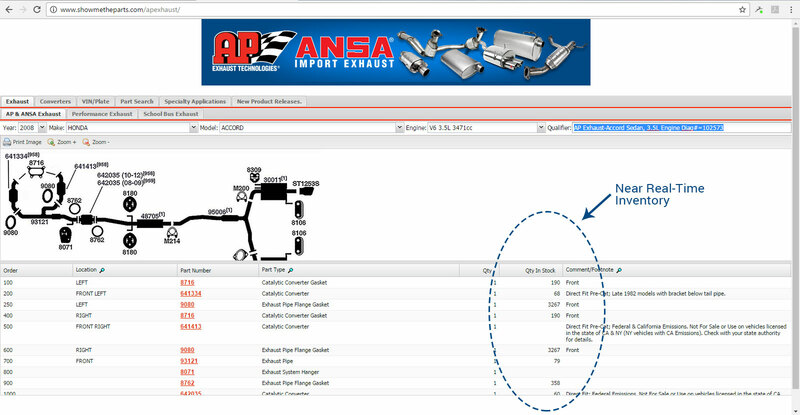 We recently added this feature to AP Exhaust’s catalog to take some of the work out creating a parts order. This system is automated, so when a part is ordered, it’s subtracted from the inventory automatically. These inventory changes are pushed to the website every hour, which is far faster than the days it can take to get information into a system by manually filing and checking orders against the inventory. Automating this process also eliminates errors made when transferring stock information to the system, so the inventory is always accurate. For buyers ordering from a distributor or wholesaler, that means they don’t have to call ahead to make sure the parts they want are still available. AP Exhaust added real time reporting to their site at the request of their customers. Their distributors already use SMTP to find the parts they want to order, so it seemed logical to display the inventory alongside the parts information. This doesn’t just shorten the time it takes to make an order, it makes it easy for these customers to choose alternative products if the part they want isn’t currently available. 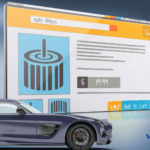 Now, automotive aftermarket companies can easily add ShowMeTheParts catalog lookups to WordPress websites with a new WordPress plug-in created by Spork Marketing and Vertical Development, Inc. Combining our ShowMeTheParts’ massive aftermarket parts database with the world’s most popular website platform makes bringing parts information to your customers easier than ever before. The first company to use this new tool is GMB North America, Inc. On the previous GMB North America website, customers had to leave the site to check parts information on ShowMeTheParts.com. As part of developing a new website for GMB, Spork Marketing created a WordPress plug-in that integrates GMB’s ShowMeTheParts catalog directly into the WordPress website system, so now customers can find what they need for their vehicles immediately. The results are now live on GMB’s website, www.gmb.net. Recently, Aftermarket Business World shared an article detailing Gorlick’s Distribution Centers and ShowMeTheParts’ collaboration, modernizing Gorlick’s B2B ordering system. This was a challenging endeavor given Gorlick’s volume and variety of inventory. Read here how we were able to tackle the challenge and work with Gorlick’s to create an easy-to-manage system for the company and a simplified buying process for its customers by leveraging the power and scalability of ShowMeTheParts and integrating the database and shopping cart into Gorlick’s existing website. Ready to get started on your e-commerce site? Call us at (847) 609-9540 or email sales@verticaldev.com.